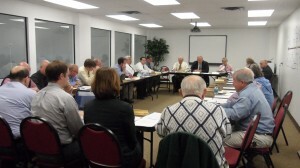 CHESHIRE, Conn. – The Connecticut Interscholastic Athletic Conference Board of Control met for its monthly meeting on Thursday May 1 in Cheshire. The Board considered a report from a member school principal on addressing sportsmanship concerns at the CIAC basketball championships. The Board approved a motion to place the schools’ boys basketball team on probation for the 2014-15 season for sportsmanship-related issues. The Board acted upon a self-report from a member school principal for use of an academically ineligible player in two baseball contests. The Board approved a motion to fine the school $200 ($100 per incident) for the use of an academically ineligible player in two games. The team had already forfeited the two games and notified the opposing teams. The Board acted upon a self-report from a member school principal for a violation of players competing in outside teams in the same sport during “the season in” girls lacrosse. The Board approved a motion to fine the school $100 for the violation. The Board considered and denied a request from a school to have more than one “team of one” in the sport of gymnastics with the different athletes competing for more than one other school. The Board acted upon a self-report from a member school principal for a violation of player competing on an outside team in the same sport during the season in girls lacrosse. The Board approved a motion to fine the school $100 for the violation. The Board approved a by-law change giving the cooperative team committee the authority to deny co-op team requests if any of the schools applying were previously part of a disbanded co-op that has left schools without a program in which to compete. Along with the voting items the Board heard reports on the impact of potential legislation on concussion education and sudden cardiac arrest, considered the proposed CAS-CIAC 2014-15 budget, and heard consultant reports. This was the final Board of Control meeting for the 2013-14 school year but approved by-law changes will be considered at the CAS Annual Meeting on May 29.